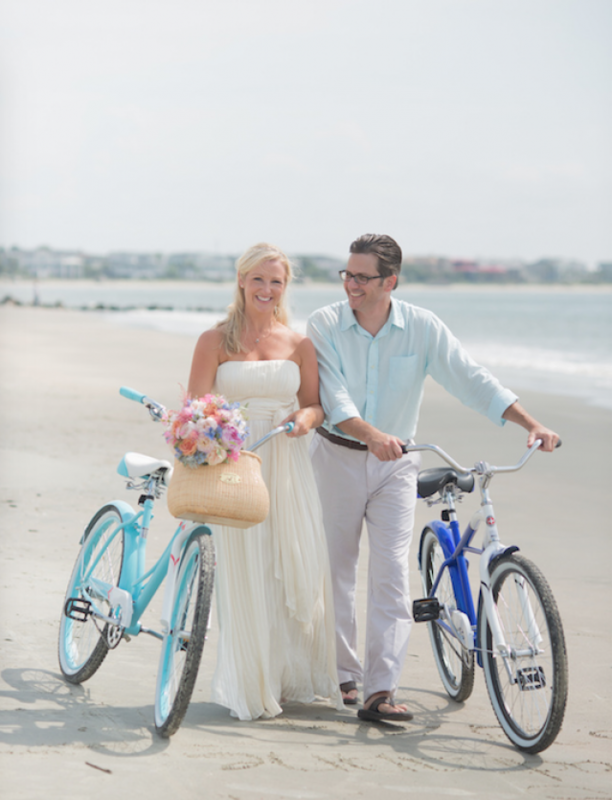 Locals Adrianne and Tom biked to their beach wedding on Sullivan’s Island. Paperwork: Must mail letter of request and receive confirmation of permission granted. Click here for the form. For additional information, contact Lisa Darrow, ldarrow@sullivansisland-sc.com, (843) 883-5744. 4. Stay off the dunes. 5. Leave sea oats and sea turtle nests be. 6. Adhere to parking signs and respect private parking. 1. No more than 24 guests are allowed at a private party held in a rental. 2. Rental properties' sleeping and parking capacities vary and must be respected. 3. A noise ordinance is in effect from midnight-7 a.m.
4. For the protection of nesting loggerhead turtles, oceanfront properties must leave ocean-facing outdoor lights off from May 15-October 1. 5. For a list of groups that rent properties on Sullivan’s Island, click here. For more Sullivan’s Island FAQ, click here. 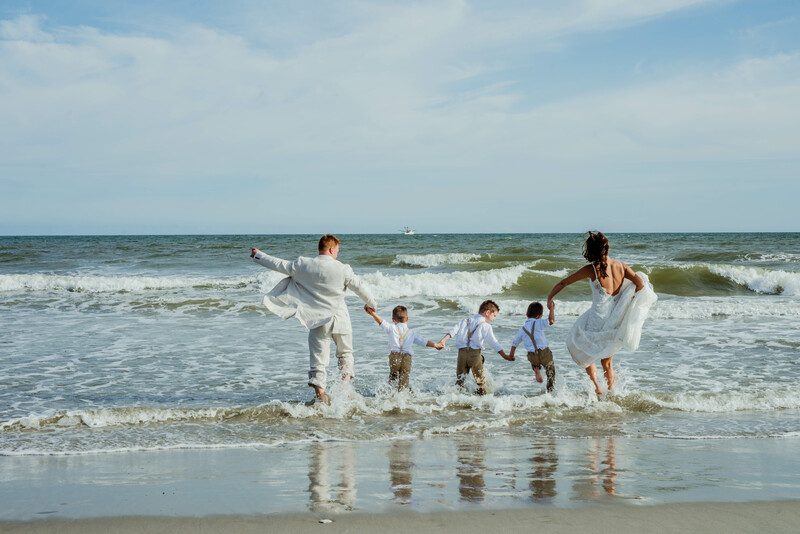 Ashley and Frank took to the waters of Folly Beach with her kids after exchanging vows surfside. Paperwork: Special event notification must be filed 24 hours before ceremony for any event at any rental or private property or beach wedding with 25-plus people. Click here for the pdf and here for the online form. For additional questions, contact Colleen Jolley, cjolley@cityoffollybeach.com, (843) 513-1836. 2. No ceremonies in front of the TIDES Folly Beach hotel, The Folly Beach Fishing Pier without special permission of the properties. 3. Motorized vehicles and golf carts are not allowed on the beach or in gated Coast Guard Base. 4. Only birdseed or real flower petals (or other organic material excluding rice) are allowed for tossing. 5. No open fires or tiki torches are permitted. 6. Ceremonies, parties, gatherings are not allowed when the sun goes down, or when the tide reaches the site, whichever comes first. 8. Stay off the dunes. 9. Leave sea oats and sea turtle nests be. 10. Adhere to parking signs and respect private parking. 11. All four tires should be off the pavement when parking streetside. 12. If you don’t rent or your rental doesn’t have its own beach access, use public walkovers to access beach. 1. Currently, there are no restrictions on number of guests or vehicles allowed at rentals and there is no noise ordiance. 2. Search “Folly Beach, South Carolina, rental home” for a slew of agencies and properties. For more Folly Beach wedding FAQ, click here. Shortly after their Big Day, Amy and Bryan donned their wedding attire and hit the Isle of Palms beach for these portraits. Paperwork: No paperwork required for couple. 1. Professional photographers must have an Isle of Palms business license to cover beach weddings. 2. Other professional vendors are not allowed to work on the beach. 3. Caterers are welcome at rental and private properties but need an Isle of Palms business license and must follow the hospitality tax ordinance. 4. Items brought onto the beach for the ceremony—chairs, flowers, altars, etc.—must be removed when the ceremony is over. 5. Stay off the dunes. 6. Leave sea oats and sea turtle nests be. 7. Adhere to parking signs and respect private parking. 8. All four tires should be off the pavement or road when parking streetside. 1. No more than 40 guests are allowed at a private party held in a rental. 2. Rental properties' sleeping and parking capacities much be respected (the max capacity for vehicles on the island is 12 per property). 3. A noice ordinance is in effect Sunday-Thursday from 10 p.m.-10 a.m. and Friday-Saturday from 11 p.m.-10 a.m.
4. Oceanfront deck or porch lights may not be used between May 1 and October 31. 5. Search “Isle of Palms, South Carolina, rental home” for a slew of agencies and properties, including Wild Dunes Resort. For more Isle of Palms wedding FAQ, click here. 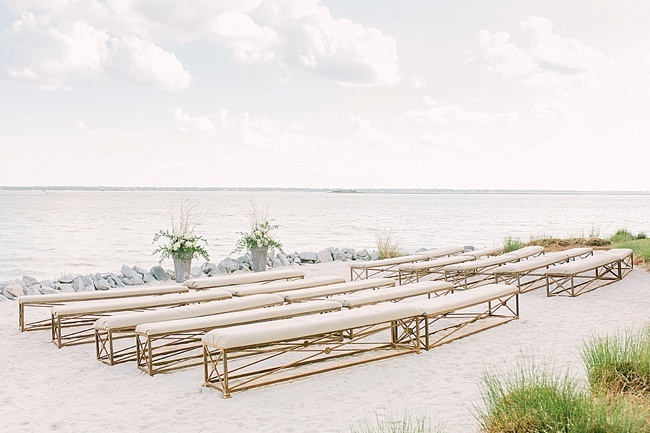 Seabrook Island Club’s Ocean Terrace invites open-air ceremonies, like this setup for Clair and Alex’s wedding. 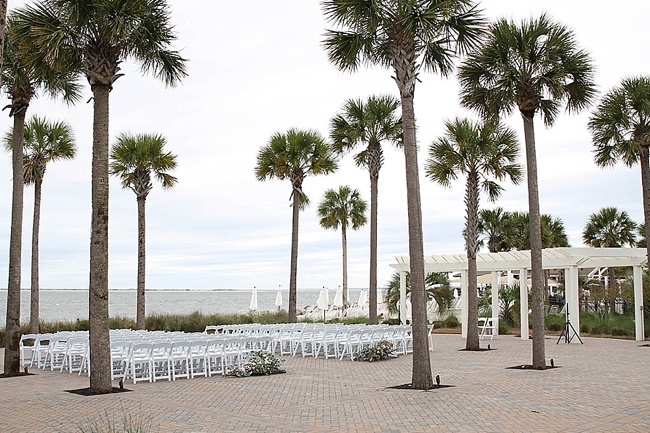 All weddings on Seabrook Island must be conducted through the Seabrook Island Club. Members and non-members are welcome. For more Seabrook information, click here. 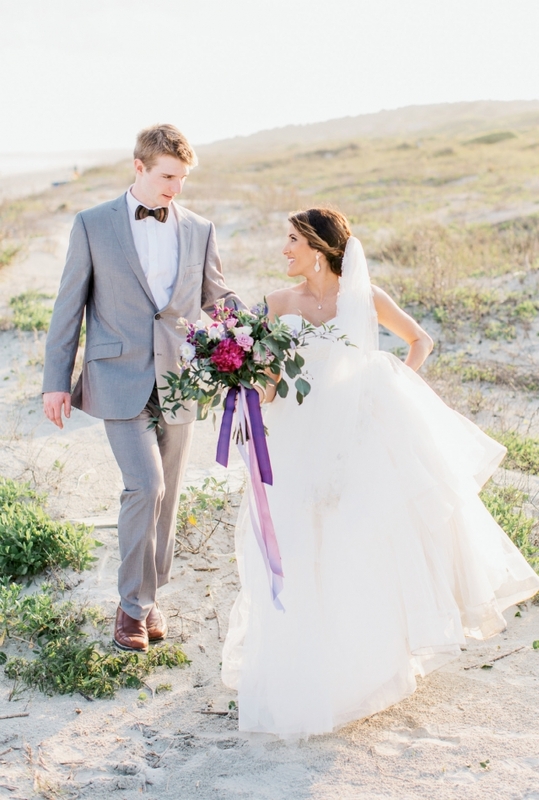 David and Michelle met on Match.com and a year and a half later said “I do” on Kiawah Island. Paperwork: No forms required, but couples do need to call the Kiawah Island Code Enforcement Office and Kiawah Island Community Association (KICA), both at (843) 766-9194, to tell the staff about the event at least 45 days prior to the wedding. You should share who is getting married, how many guests, when, and where on the beach. Click here for details. 1. Professional vendors need permits from the town of Kiawah Island. 2. Car passes to the island must be ready at the gate for wedding guests and displayed in windshields. Call KICA (843/768-9194) to arrange. 3. No fires, fireworks, glass, motorized vehicles, horses, or loud music allowed on the beach. 7. Lights must not be shining on beaches from 9 p.m.-onward to protect sea turtles. 1. A noise ordinance is in effect from 11 p.m.-7 a.m.
4. Search “Kiawah Island, South Carolina, rental home” for a slew of agencies and properties. 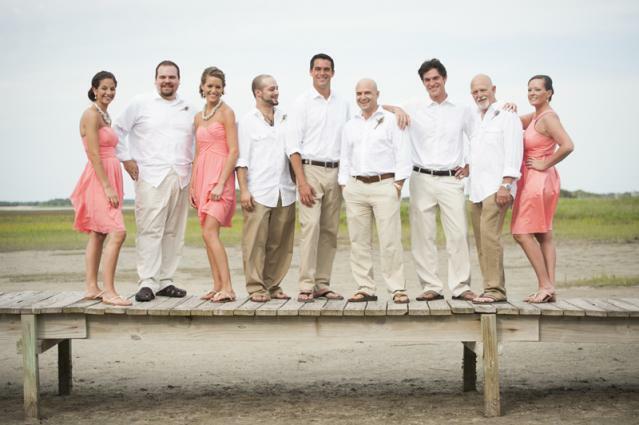 For more Kiawah wedding FAQ, click here. Elizabeth and Rob booked this private home on Edisto Beach for their nuptials. Paperwork: For weddings with fewer than 50 guests, no permission is needed. For those with more than 50 guests, and/or for those with entertainment at a rental property that will pass the 10 p.m. noise ordinance restriction, a special event permit (and fee) are required and should be submitted 45 days prior to the wedding. Click here for the form. For more information, click here and call the town hall at (843) 869-2505. 1. No fires, fireworks, or glass allowed on the beach. 2. Event tents and chairs need to be removed by dusk. 2. For oceanfront properties, oceanside lights must be out by dusk. 3. No vehicle limit at rentals. 4. Check with rental agency or homeowner for additional rules; many rental companies require an event fee and some require portable restrooms so as not to overload plumbing. 5. Search “Edisto Island, South Carolina, rental home” for rental agencies and properties or click here for a list. For more Edisto wedding FAQ, click here. Mary and Alejandro’s wedding party loved the couple’s Goat Island getaway celebration almost as much as the lovebirds did themselves. Goat Island is a tiny hideaway off Isle of Palms. Accessible only by boat and populated with a handful of private homes, it’s for those who love a shipwrecked feel. 1. Search “Goat Island, South Carolina, rental” for homes. 2. Full-Service Weddings: For a full-service venue and coordinator, check out Goat Island Gatherings. Calder Clark planned all the elements of Liz and Adam’s wedding to look as though they were part of the island or made from finds that had washed up there. Dewees Island is a short ferry ride from Isle of Palms. The boat-access only island is void of cars and home to a community that prides itself on living in sync with nature. Houses range from small cabins to luxury beach manses. Regulations: Check with your rental host for details. 1. Search “Dewees Island, South Carolina, rental” for homes. For more information (and rentals), visit Dewees Rentals. The Cottages on Charleston Harbor hide a charming sandy spot ideal for intimate weddings, like Kelley and Tom’s. A handful of properties welcome weddings to their private beaches on Mount Pleasant’s Patriot’s Point. Each carries their own set of regulations.